© 2002, © 2018 by Paul Freeman. Revised 10/4/18. 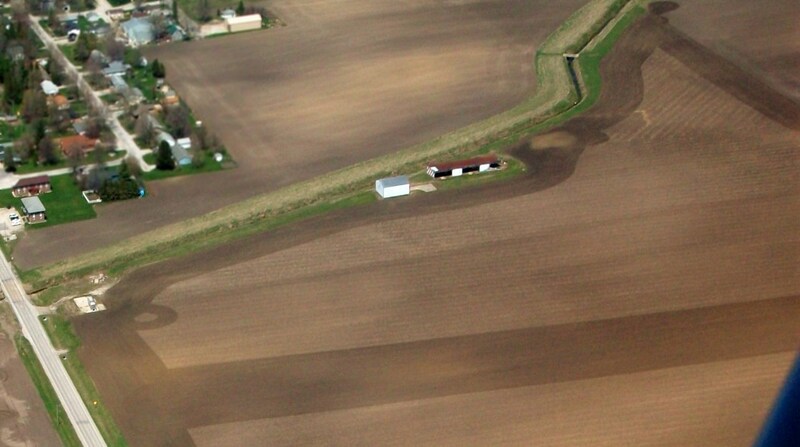 Carmi Municipal Airport, as depicted on a 1/30/73 USGS aerial photo. as it was not yet depicted on the 1965 1965 USGS topo map. 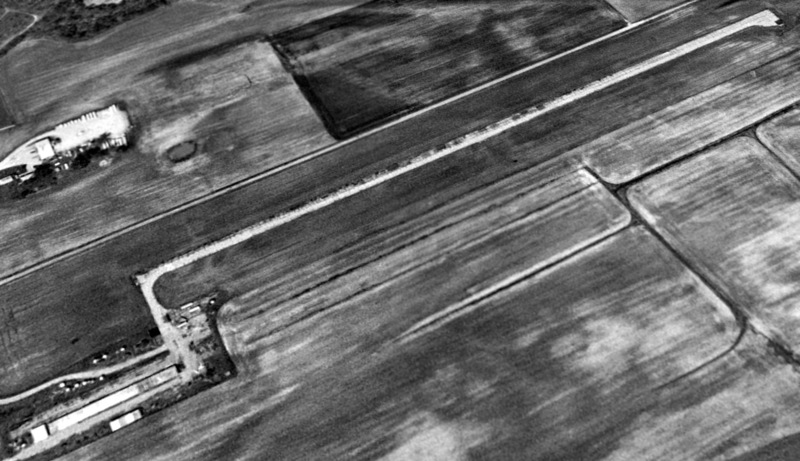 The earliest depiction which has been located of Carmi Municipal Airport was on a 1/30/73 USGS aerial photo. and a paved ramp with a few small hangars & 1 light single-engine aircraft on the southeast side. and a paved ramp with a few small hangars & a beacon on the southeast side. by a somewhat larger airport only a mile to the southeast. The original Carmi airport was presumably closed at that time. A 1994 aerial view looking northwest depicted the original Carmi Municipal Airport after its closure. The paved runway was still intact, but the paved parallel taxiway had evidently been removed. The paved ramp & few small hangars remained on the southeast side. 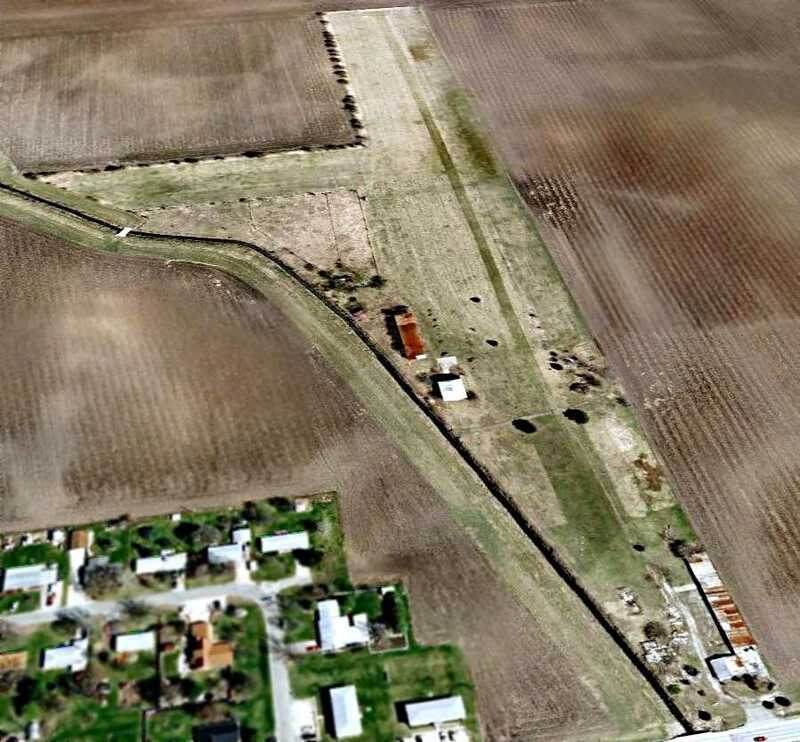 A 2016 aerial view looking northwest the original Carmi Municipal Airport's paved runway remained intact but deteriorated. The hangar had been removed at some point between 1994-2016, with its foundation still visible. The site of the the original Carmi Municipal Airport is located at the northern terminus of Airport Road, appropriately enough. Thanks to Richard Carlson for pointing out this airfield. 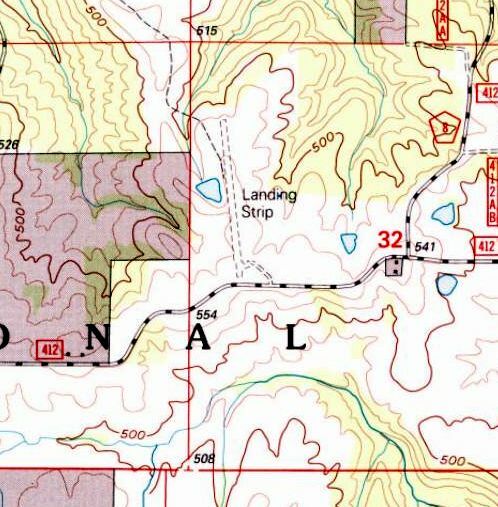 Dixon Springs Airport, as depicted on the 1984 USGS topo map. as it was not yet depicted on a 1963 aerial photo nor on the 1965 USGS topo map. The earliest depiction which has been located of Dixon Springs Airport was on the 1984 USGS topo map. 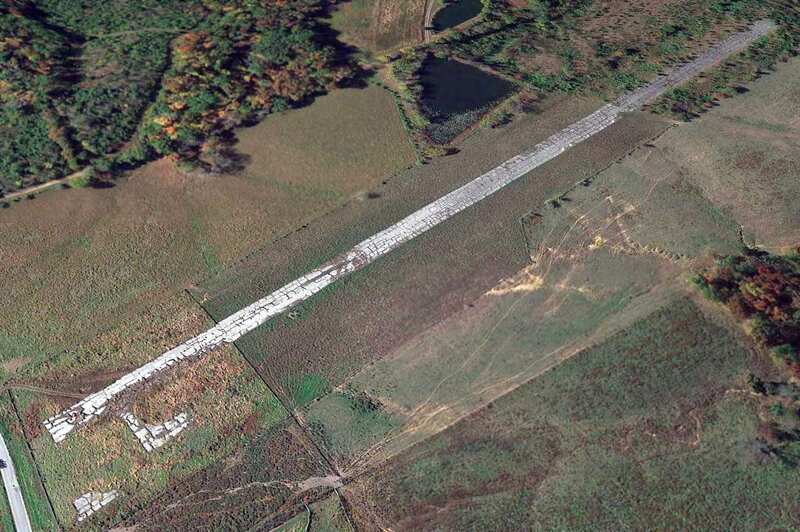 It depicted a single north/south paved runway, labeled simply as “Landing Strip”. David Bertellotti recalled, “The Dixon Springs Airport... During my flight training I landed at this airport while on a check flight in 1987. We landed, turned around & took off again. The strip was only 2,000' long or so, with a tiny paved area adjacent to the south threshold. I landed there again in 1992. The pavement was in very good condition (asphalt), but other than the runway, there was nothing else that I recall - no structures, phone booth, nothing. 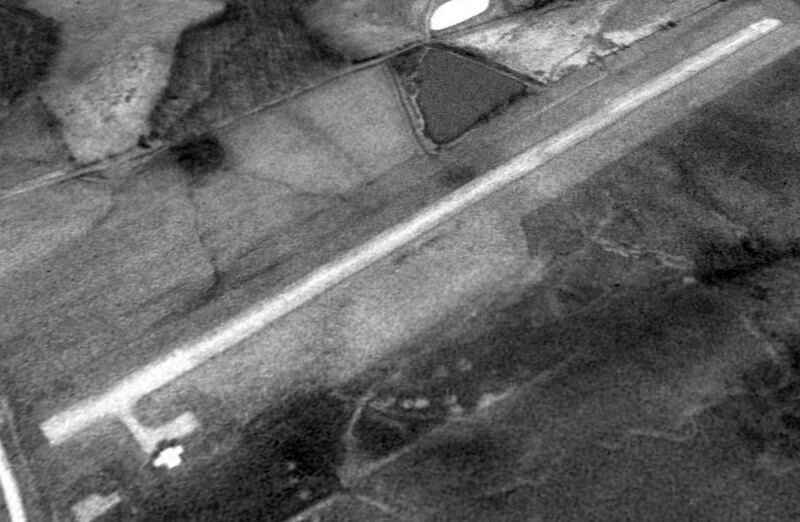 The earliest photo which has been located of the Dixon Springs Airport was a 1993 USGS aerial view looking northwest. with a short taxiway leading to a small ramp on the southeast side with a single T-hangar. 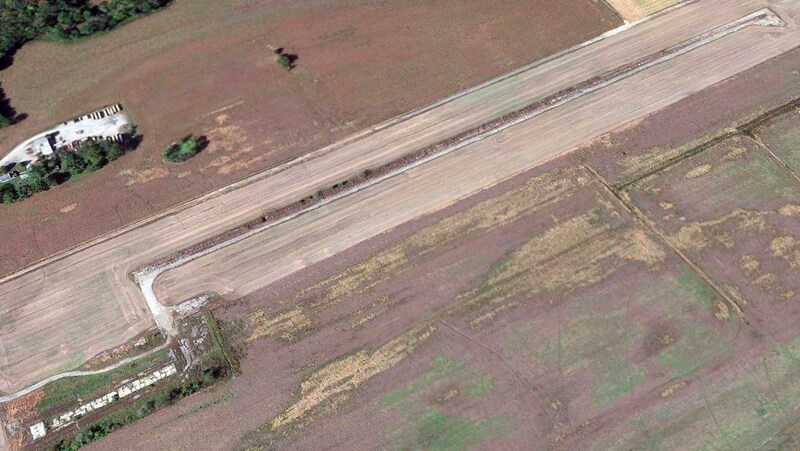 A 2015 aerial view looking northwest at Dixon Springs Airport showed that the paved runway remained intact, though heavily deteriorated. The T-hangar had been removed at some point between 1993-2015. 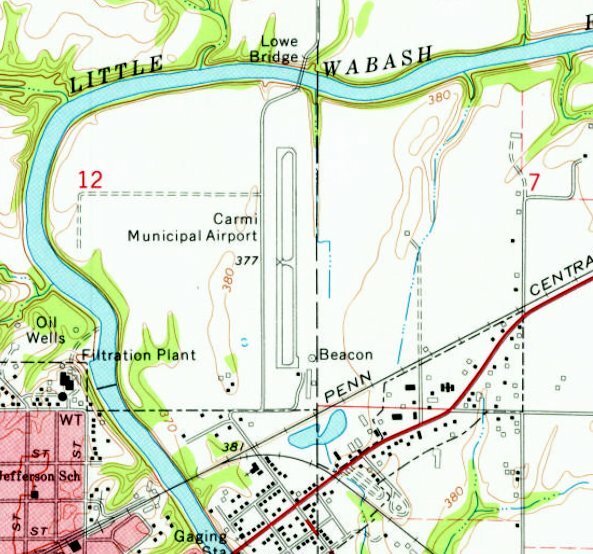 Dixon Springs Airport was no longer depicted at all (even as an abandoned airfield) on the 2016 Sectional Aeronautical Chart. Dixon Springs Airport is located northwest of the intersection of Route 145 & Air Port Road, appropriately enough. Thanks to David Bertellotti for pointing out this airfield. 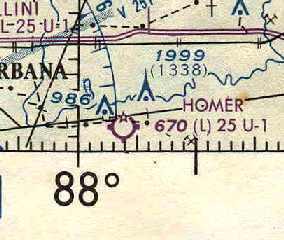 Homer Airport, as depicted on the December 1976 World Aeronautical Chart (courtesy of Chris Kennedy). as it was not listed among active airfields in the 1971 Flight Guide (according to Chris Kennedy). was in the 1972/73 Illinois Airport Directory (according to Bill Pagett). Homer was listed as a Restricted Landing Area, having an east/west 2,200' runway. The owner was listed as K.L. Wronke. Greg Burnett recalled, “Homer Airport... I was one of the student pilots whose instructors took them to Homer to learn about soft-field operation. At the time I went there (early 1970s, in a Cherokee 140), there was a wrecked twin-engine plane lying near the eastern end of Runway 9/27. That was confidence-inspiring! Oh, great… and we hit it… and we were in the air! The 1974/75 Illinois Airport Directory (according to Bill Pagett) described Homer as a Basic Utility airport. The airport description was otherwise unchanged from the previous directory. 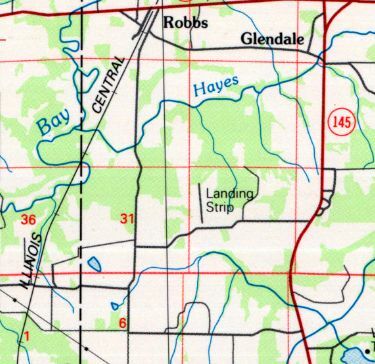 Homer Airport was not depicted at all on the 1975 USGS topo map. was on the December 1976 World Aeronautical Chart (courtesy of Chris Kennedy). It depicted Homer as having a 2,500' runway. Old-time instructors in the area have told about taking students to "the old Homer Airport"
& getting stuck there on hot summer days. as having 2 turf runways: 2,500' Runway 9/27 & 1,100' Runway 18/36. It was said to offer hangars, tiedowns, repairs, and charter. described Homer as having 2 turf runways (9/27: 2,500' & 18/36: 1,200'). depicted Homer as having a single 2,000' unpaved Runway 9/27. Several small hangars were located on the west & northwest sides of the field. A parachute operation symbol was also depicted. No aircraft were visible on the field, though. Homer Airport drifted into disarray & closed in 1994 when the owner ran into legal problems. It was no longer listed among active airfields in the 1994/95 Illinois Airport Directory (according to Bill Pagett). in addition to the 2 grass runways, the airport had a few small hangars & other buildings. on recent aeronautical charts or USGS topo maps. but reportedly the NDB hasn't operated in years. Joel Nordness recalled, “I lived in Homer from 2004-2008, a quarter mile north of the airfield. including 2 grass runways, and a few small hangars & other buildings. A 4/19/14 aerial view by Joel Nordness looking northeast at the remains of Homer Airport. Joel Nordness reported, “You can definitely see the difference between my pictures & the one from 2008. The whole area is much less apparent in the background; only some mowing lets you know where the boundaries are. Homer Airport is located on the east side of Route 49, adjacent to the southeast side of the town of Homer. Thanks to Mike O'Malley for pointing out & providing information about Homer.